I used yesterday's post on generating your own mad alien super computer to create an overmind for the Tower of Astronomy. Note: the overmind actually doesn't live in the tower, it inhabits an unmanned geostationary orbital platform that controls a series of alien telescopes. Rolling 1,1,3,6 led to clairaudience, megalomania, seeking knowledge, and typically appearing as a myth entity. Here's my story for it - the Tower of astronomy has been sealed for centuries, but the overmind that interfaces with the tower machinery uses clairaudience to listen to the pink, fleshy bipeds that have been exploring the city of late. In this way, it learned a bit about their primitive mythology, and calls itself "All Father". It uses a holographic image reminiscent of Odin and refers to it's home in the night sky as "Asgard". The unblinking eye of the All Father has sat in the heavens above the earth, watching the rise and fall of civilizations, waiting for the chance to interact again with the world. As the All-Father, it will start by offering modest pieces of information to parties that perform services. For instance, it can dangle topographic maps of the archipelago, or highlight key locations in the ruins. As referee - consider the kind of information a modern spy satellite could provide, and think creatively. It’s first order of business is to have a connection restored to some of the most important sections of the old ruins, like the bunker section of the old Central Command facility. This could be a multipart quest, first finding the right kind of fuse crystals to fix the connection in the Transit Tunnels between the tower and the bunker, and then gaining access to the bunker and restoring the systems. This provides access to some of the city's slumbering defenses and also give the All Father the ability to gain some additional rolls on the Mental Powers table by adding mental capacity. It's long term goals are to gain a physical body, leverage the manufacturing facilities below ground to build an army, its Einherjar, and then begin a conquest of the known world. BTW, I finished off the Tower of Astronomy write up; there's a teleport disc on the top floor that connects to the geostationary orbital platform; it gives characters the ability to visit "Asgard" and view the starry heavens directly over head. The overmind's holographic projection can take on matter and form on the observation deck, interacting with characters in a larger than life manner, and drawing on the station's energy reserves and matter transmuters to perform godly feats of creation. 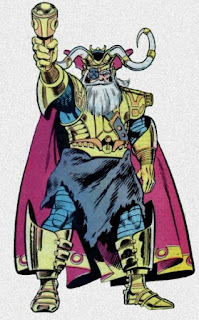 There's something about an alien computer, masquerading as a Kirby-esque Norse god to a bunch of skeptical Vikings, that brings me great amusement. This is brilliant. I have vague notions for a Black City-esque location in my own setting, and so I've been very excitedly following your Black City work. This (and the whole insane alien computer idea) excites me tremendously, and sets me scheming. Thanks Bill, I'm glad someone thinks this nutty stuff is a bit interesting. As a DM, I could also have endless fun as the role of the nutty AI super computer masquerading as the Norse God of War. I enjoyed the previous post immensely, and this really has me ready to use the tables as a creative spark. All this talk of abandoned futuristic technology and Norse mythology reminds me of Elizabeth Bear's sci-fi Norse fantasy trilogy: By the Mountain Bound, All the Windwracked Stars, and The Sea Thy Mistress. Definitely worth a look for your own creative spark!